loke is among us again. we are proud to present another incredibly stunning track from the electropunk master. psychoacoustic audio experience for your already tortured mind. the track has some obvious influences from the, ohso wonderful autechre, sean booth & rob brown. 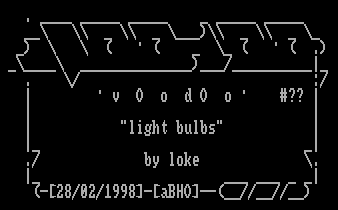 loke has now achieved the same atmosphere with crushing light bulbs and other interesting sound elements. what can i say? 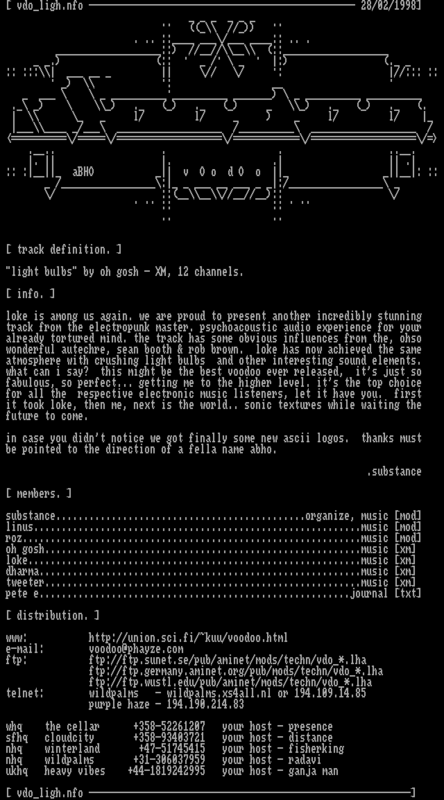 this might be the best voodoo ever released, it’s just so fabulous, so perfect… getting me to the higher level. it’s the top choice for all the respective electronic music listeners, let it have you. first it took loke, then me, next is the world.. sonic textures while waiting the future to come. in case you didn’t notice we got finally some new ascii logos. thanks must be pointed to the direction of a fella name abho.